For reasons I can’t even explain to myself, I woke up one morning in early 2010, and decided I was going to watch, in chronological order, all the movies made from Broadway musicals as a sort of Proustian trail of memory thru which I could summarize my thoughts & feelings on a subject near and dear to me, lo, these fifty-some years. I don’t know how I came to be obsessed with Bway from such an early age. No one took me by the hand, or mentored me on the subject. I discovered its universe entirely on my own, tho back in the late 50s/early 60s when I came of age it wasn’t quite the esoteric realm it is today. The influence of Bway was everywhere. “Legit,” as Variety calls it, was in equal standing with films, TV, music and radio in the national entertainment industry. In the age of Elvis and The Beach Boys, show albums were consistently top sellers, charting for multiple years in some cases, and the great American songbook was stocked with music originally written for Bway, and recorded by just about every jazz and pop vocalist or orchestra on the planet. But if you were 3,000 miles away from Times Square the greatest source, the unmatched portal to discovering the classic Bway canon was thru the movies. I can’t remember a time I didn’t know about Broadway. And tho I envy my friends who have been sitting in Bway theatres since they were children and saw so many of the great and lesser shows that have often tickled my imagination; I know there are many more like me, who didn’t get to New York until many years later, and who learned and loved their musicals thru those then ubiquitous original cast albums, but saw them mostly thru the movies. How strange it all seems now to imagine musicals (tho they dominate Bway now much more than they did 50 years ago) as a national shared pastime, a cultural bulwark; as catnip to Hollywood, having risen to prominence and stature; winners of no less than 4 top Oscars of the sixties; with another 6 nominated for Best Picture between 1956-72. Yeah, they were once legit. I grew up watching these movies, on Cinemascope screens in the gigantic Hollywood movie palaces, or in the suburban grind houses, or even further removed on B&W television screens about the size of today’s laptops. The films grew and then outgrew, much as I did, their corpulent styles to the point of obsolescence. Happily there’s a mild revival this last decade, but a scan at today’s popular film genres shows little encouragement for this sort of thing. I scoff at the argument so often made these days that people can’t understand why someone just starts singing in a film. You simply go along with it, much as you do Spiderman for Chrissake. What’s to understand? The point is to enjoy the emotion, dig the music. And when you do, there’s no other feeling like it—it soothes the heart, tickles the brain. Original musicals made in Hollywood are numerous and legion in qualities both good and bad, but for the most part they’re not to be part of this conversation. I debated including studio movies that had something of a Bway ambition or pedigree, but with a few admitted exceptions I will not stray from the template. So here’s the program: Broadway to Hollywood, or [for brevity’s sake] Bway2Hlwd but not from ground zero. They were filming Bway musicals before there was even sound, and let’s face it, the 20s and 30s, were terrific song recitals, but the Golden Age of the Bway musical (1943-1969) began with Oklahoma! and its influence would not only revolutionize Bway, it would transform the musical in film. 60 years on, technology makes this celluloid history available at our fingertips in the privacy and convenience of our homes. As one who was unduly shaped and influenced by this particular genre I’m curious to examine it in toto; revisit my feelings and impressions and the memories they conjure up. As an only child of immigrant parents, growing up in a spanking new suburban universe, cupid’s arrow hit me at the confluence of Hlwd & Bway. This is a journey thru the signposts of my life. I know there are others out there with parallel histories, similar passions and obsessions. This blog is for us to trade notes, discuss and revel in the world of the Broadway musical as preserved, revised and interpreted by Hollywood. 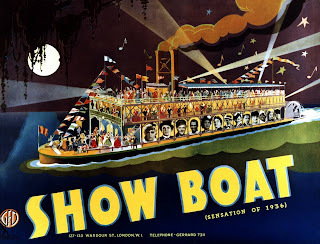 Up until the 1950s, with the exception of the 1936 Show Boat (and isn’t Show Boat always the exception to the rule?) the filmed Bway hits were routinely pillaged, bowdlerized, and stripped of their best assets. 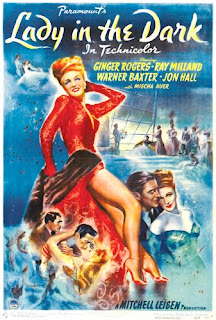 Cases in point: On Your Toes, Babes in Arms, Anything Goes, The Boys from Syracuse, Louisiana Purchase, Panama Hattie, Best Foot Forward, Let’s Face It, DuBarry Was a Lady, Yokel Boy, Knickerbocker Holiday, Something for the Boys, Up in Central Park, One Touch of Venus, Lady in the Dark. See the Bway hits on the screen! Except you didn’t. Not then, not yet. Oklahoma! would take a good dozen years to make it to Hlwd, but in its wake as Bway blazed with new integrated shows, Hlwd took notice and likewise grew, so by the time the first Bway musical of the Golden Age reached the screen, Hlwd could meet it halfway. That musical, and the starting point of my journey is: On the Town.